I haven’t updated in so long that I feel like I should have so very much to say. On the other hand, I’m feeling like there’s really not TOO much to tell. Here are some snippets from the past few weeks. FL was wonderful! I was so glad I could be there for Tad and Erica’s graduation—especially when their “real” family broke promises about being there. My brother sent them the most clever gift–checks for $20.06. FL also meant lots of time in the pool, two trips to the beach, and a little shopping thrown in for fun. Summer has officially begun in my corner of the world. My interns, Ben and Kali, arrived last week and we started with our first group of kids yesterday. This is the year of the quiet interns as opposed to last year’s interns of hilarity. They’re doing a fantastic job so far. 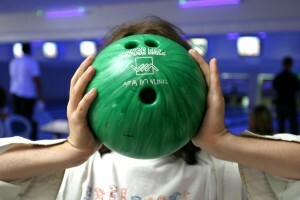 Yesterday we took the kids bowling in the afternoon. It was the l-o-n-g-e-s-t single game in history. Three adults, ten kids, ten frames each, two hours. I was hoarse by the end—too much, “The GREEN ball not the orange one!” “This side, this side, this side, this side, THIS SIDE . . . ” Thankfully, yesterday was probably the worst day of the whole summer. It’s nice to get the worst over with first. Organization arrived on the main floor of my house over Memorial Day weekend. It took a long time and a lot of work, but it’s there. And I’m working hard to keep it that way. Now this weekend it’s time to tackle the bedroom again. Perhaps I have some organizational disorder prohibiting me from having more than one neat area in my life at a time. Dates were multiple last weekend. I didn’t know it was possible, but apparently it is. One was a thumb down and a thumb sideways—generally a nice guy, but there was something not quite right. Not in a creepy kind of way, but in a makes you go hmmmmm kind of way. The other was a two thumbs up—we met for lunch and 8 1/2 hours later he said he should probably get going. Mind you, we didn’t eat all that time. There was mini-golf, a movie, and a lot of talking in there, too. And I think that’s enough of nothing for tonight.